The key to perfecting the flawless Miss Universe hairstyle is to start with a solid foundation. Start by spraying the OSiS+ Soft Glam Prime Prep Spray all over your damp hair and combing it through. To achieve a more natural look with hair extensions, it's best to curl the extensions once they are in place to ensure that they blend in seamlessly. 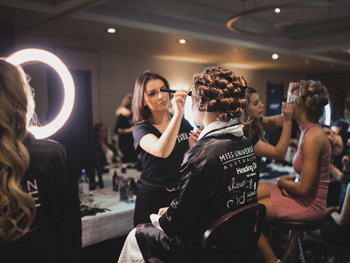 Apply OSiS+ Soft Glam Plumping Shine Mousse starting at the roots of the hair and slowly working it through to the ends - this will give the hair texture and movement, which is essential when creating the voluminous Miss Universe Australia curls. Now the styling begins. Get out your round brush and hairdryer, because it's time to do a blow wave. Schwarzkopf Professional's top tip for creating beautiful, bouncy curls is to first blow-dry your hair, section and pin it into hot rollers straight away, then leave them to cool – which helps the hair set. Once cool, remove the hair from the rollers and use a big tong curler to apply some extra curls. Top Tip - if curls around your face aren't sitting, as you'd like them to, use a curler to further shape and frame curls around your face as desired. Finish the look by combing the hair back and applying a texturising dust like OSiS+ Session Label Powder Cloud to the roots for added texture and volume. Once you love your look, lock it into place with Schwarzkopf Professional OSiS+ Sessions Label Super Dry Flex, and you're runway ready! If you have short or thin hair and want to add extra volume to this look, consider investing in clip in extensions. They are an easy way of giving your hair added volume and length. 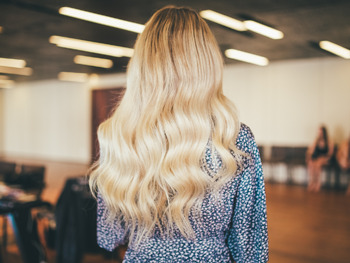 To achieve a more natural look with hair extensions, it's best to curl the extensions once they are in place to ensure that they blend in seamlessly. Using mattifying powders such as Schwarzkopf Professional OSIS + Session labels - Dust it flex, helps the clips grip on the hair and stops them from moving, which is extremely helpful when you're curling or styling the extensions.